Last night I eagerly watched the movie, Amelia, to learn more about this feminine icon. I expected to be wowed by her determination and accomplishments. I was. In a time when some leaders such are heralded for their self-promotion and self interest, it’s refreshing see how Amelia Earhart handled her role as the first flyer woman to set so many records. Like many entrepreneurs she learned to merchandise her name. But unlike many wanting center stage to themselves, she was a fervent advocate of encouraging other women to join her on stage as acclaimed woman aviators. In a time when most women didn’t know how to drive, Amelia flew across the Atlantic Ocean. She set the women’s altitude record. Wanting to break free of women-only records, she flew solo across the North American continent and back. Like many pioneer women flyers, Amelia competed in air races for women. In 1929 she flew in the Santa-Monica-to-Cleveland Women’s Air Derby. At the final race-stop, Amelia and her friend Ruth Nicols were tied for first place. During takeoff, Nicol’s airplane flipped over at the end of the runway. Amelia ran to her friend, pulled her from her plane, and only continued the race once Nicols was safe and proclaimed okay. Amelia’s concern for her friend caused her to lose a chance at first place. She came in third in that race. Amelia demonstrated how the winner’s platform was a mile-wide with room enough for others. 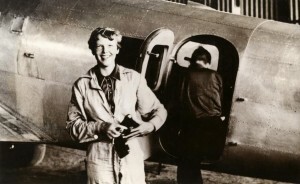 Whenever interviewed by the press about her feelings about not winning competitions, her responses praised the growing pool of talented women aviators.